After what many would consider a horrific start to this off-season, the Blazers have now taken their money and opened their eyes to the Sixers' Andre Miller. Many have speculated about Portland's level of interest in Miller for months, but nothing has actually come out until now. 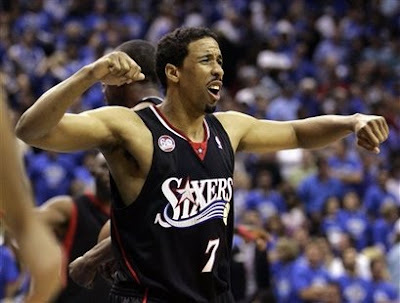 Twice spurned in their attempts to sign a high-profile free agent this summer, the Portland Trail Blazers are jumping back into the fray, opening discussions with the agent for Philadelphia 76ers free-agent point guard Andre Miller, according to sources. A deal is not imminent, but there has been progress made toward resolving Miller's status, according to a source with knowledge of the discussions. The Blazers have been looking to upgrade at point guard but didn't get very far in talks with Dallas guard Jason Kidd (who re-signed with the Mavericks) or Phoenix's Steve Nash (who agreed to a two-year, $22 million extension with the Suns on Monday). Portland was not looking hard at Miller because the Blazers thought they needed to add someone to the roster with more perimeter shooting skills than the 33-year-old. But with $7.7 million in cap room and a dwindling number of free agents available, Miller may be Portland's last best chance to bring in a veteran player that can help its young core. The Andre Miller bandwagon is a hard buggy to jump on. Bringing in a point guard that can't shoot and is quickly aging is something the Blazers are actually considering? I guess Bayless' performance in summer league was not quite up to par, eh?